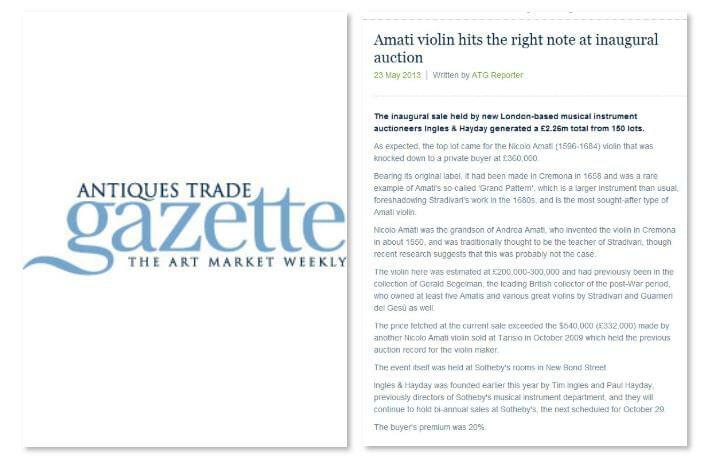 As expected, the top lot came for the Nicolo Amati (1596-1684) violin that was knocked down to a private buyer at £360,000. Bearing its original label, it had been made in Cremona in 1658 and was a rare example of Amati’s so-called ‘Grand Pattern’, which is a larger instrument than usual, foreshadowing Stradivari’s work in the 1680s, and is the most sought-after type of Amati violin. Nicolo Amati was the grandson of Andrea Amati, who invented the violin in Cremona in about 1550, and was traditionally thought to be the teacher of Stradivari, though recent research suggests that this was probably not the case. The violin here was estimated at £200,000-300,000 and had previously been in the collection of Gerald Segelman, the leading British collector of the post-War period, who owned at least five Amatis and various great violins by Stradivari and Guarneri del Gesù as well. The price fetched at the current sale exceeded the $540,000 (£332,000) made by another Nicolo Amati violin sold at Tarisio in October 2009 which held the previous auction record for the violin maker. The event itself was held at Sotheby’s rooms in New Bond Street. Ingles & Hayday was founded earlier this year by Tim Ingles and Paul Hayday, previously directors of Sotheby’s musical instrument department, and they will continue to hold bi-annual sales at Sotheby’s, the next scheduled for October 29. The buyer’s premium was 20%.